Los Angeles City College is a few miles away from me, and literally a couple of blocks from my old apartment. However, I can’t clearly remember the last time I had been on its campus. However, thanks to Sue Landers and Lambda Literary, I was invited to speak and read as part of their book club. 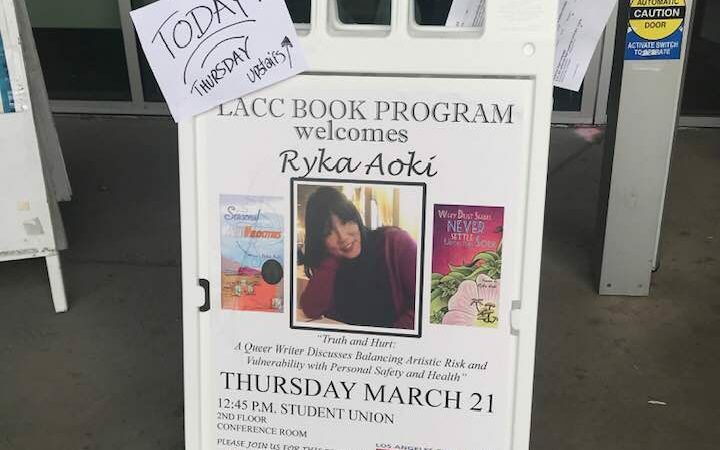 I spoke on “Truth and Hurt: A Queer Writer Discusses Balancing Artistic Risk and Vulnerability with Personal Safety and Health.” Gosh, the students seemed engaged, and they had some excellent questions. The school even did a fun book giveaway, there were yummy baked good and other snacks, and the signing was super relaxed and casual. I felt I got to see a very special part of the LACC community. or maybe the school is just that cool! 🙂 Special thanks to Professor Christine Gengaro for all the good work she did in bringing me to campus, and for the most excellent chat on Chopin after.